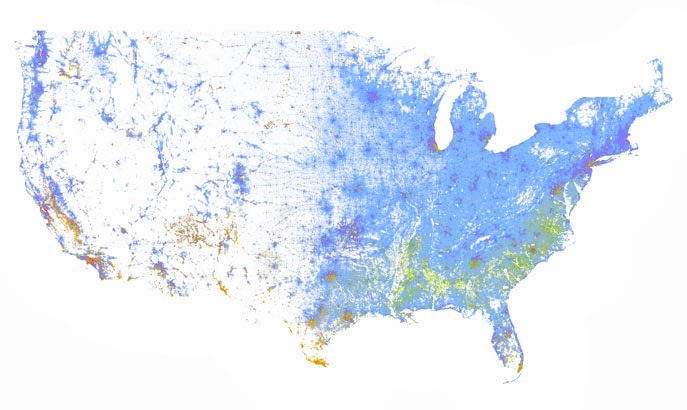 Using 2010 Census data, researchers created an interactive map with racially color-coded dots for each person residing in the United States. In total, the map has 308,745,538 dots, coded for White (blue), Black (green), Asian (red), Hispanic (orange), and Other (brown). The map is really fascinating, so you should check it out. Of course, when I realized the map was interactive the first thing I had to do was look at my respective home towns. Oakland is one of the most diverse cities in the country, and frankly is better integrated than many. Yet the map still shows clear racial segregation between neighborhoods. Along the industrial docks – the “flat lands,” as they’re called, you can see the large Black, Hispanic, and Asian populations. By the way, can you guess which area is Oakland’s Chinatown? Then to the right, as you start getting into the Oakland hills, you can see wealthy, White, Piedmont as well as the middle class, White neighborhoods of the hills. And if you’re wondering, I grew off 98th ave (bottom right). At least my neighborhood is more integrated than most – not too many White folks, but a good mix of everyone else. This entry was posted in Citizens & Civil Society, History, Justice on September 26, 2013 by sshugars.